No matter what size your business there’s always a risk that you could be the target of cyber crime. This malicious practice not only has the potential to severely harm your business but in worse case scenarios it could even bring it down. For this very reason it’s critical that you take steps to keep your business data as secure as possible. We’ve put together 4 simple processes to help you safeguard your business from the threat of cyber attack. Remember not to keep your portable devices connected to your computer since they too can become infected. Instead store them separately and check on a regular basis that you can indeed retrieve and restore your data. 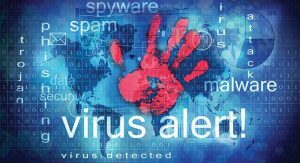 Viruses and malware can go undetected until one day you switch on your computer, laptop or mobile device to find that it’s been infected. To counteract this always install security software on your business devices and computers, checking that they contain filters for anti-spam, anti-virus, and anti-spy. Also be sure to enable your settings to update software automatically as many times security upgrades are contained within an update as a result of recent attacks or viruses. It’s amazing that even in this day and age many people still use simple passwords like ‘123’ or ‘password’ not realising that they’re leaving their computers vulnerable to hacking. Strong passwords improve digital security and it’s essential to use these on any computer containing important business information. Change your password every couple of months, and never use the same password for everything, since if someone gains access to that password, all of your accounts could potentially be under attack. Although we may be best known for our physical security services we also carry out security risk assessments. We can conduct an assessment to tell you how much your computer is at risk and make suggestions as to the best protection for you and your business. Preventative measures will cost you far less than you stand to lose in the event of a cyber attack. Get in touch with MA Security today on 1300 020 406 to see how we can help you.